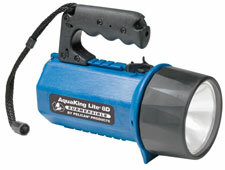 Watertight to 500 feet, 12 volt, 14 watt, 100,000 Candlepower, primary hand held light source. Made of an unbreakable ABS housing with a high impact polycarbonate lens and thermoplastic rubber shroud. YES 251.4 14.4 100,000 8D 10-12 hours 9 3/8" 4.63 lbs.